The Tibetan people are facing one of the darkest periods in their history of repression under Chinese rule. Only US Secretary of State Hillary Clinton, has spoken out publicly about the self-immolations and called for China to reform its Tibet policies. This public statement of support has given Tibetans everywhere a reason to hope. To stop this crisis other world leaders need to speak out too. DHARAMSHALA, December 2: Various sources are now confirming that another Tibetan has set himself ablaze in Tibet in an apparent protest against the continued Chinese occupation of Tibet. Tenzin Phuntsok, a former monk in his forties, reportedly self-immolated in Chamdo area of Tibet on Thursday. Tenzin Phuntsok is believed to have survived the self-immolation and has been taken to a local hospital. No other details are available at the time of reporting. Tenzin Phuntsok is being described as a former monk of the Karma monastery in Chamdo. The entire Chamdo region, especially the Karma monastery have been facing increased repression after unconfirmed reports emerged of a bomb blast at a Chinese government building in Chamdo on October 26. No casualties had been reported, although, following the blast, the Karma monastery was locked down and strict restrictions were placed on its monks. Kelsang Gyaltsen, a member of the Tibetan Parliament-in-exile had told Phayul that the blast could be a plot to frame false charges against Tibetans. "In 2001, China did the same thing, they falsely accused and jailed Trulku Tenzin Delek, an influential Tibetan religious leader on charges of a bomb blast," he said. The Karma monastery located on the eastern bank of the Dzachu river in Chamdo was founded by the first Gyalwang Karmapa, the head of Kagyu school of Tibetan Buddhism in the 12th century. Repression has been intense in Chamdo, particularly since the 2008 pan-Tibet protests. The area witnessed a dramatic tightening of security and the imposition of ‘emergency’ measures by the authorities according to a notice of strategies issued by Chinese government officials in Chamdo in 2009. The 17th Gyalwang Karmapa in a statement had called the desperate acts of self-immolation being carried out by people with pure motivation as a “cry against the injustice and repression under which they live." While urging the Chinese leadership to "heed to Tibetans' legitimate demands,” Gyalwang Karmapa said that Beijing "needs to seriously review its policies towards Tibetans and other minorities." This is the twelfth known case of self-immolation in Tibet since March this year. DHARAMSHALA, December 6: As world leaders accused China of throwing into "confusion" the ongoing world climate talks in Durban, South Africa, Tibetan Women’s Association (TWA) representatives are providing an alternative voice for Tibet at the world’s largest climate change summit. Tenzin Dolma, Joint secretary and Tenzin Woebum, head of the TWA Women’s Environment and Development Desk, representing Tibet Third Pole (T3P), an international working group of Tibetans and Tibet supporters formed in response to China’s environmental threat to Tibetans and Asians, arrived in Durban on November 28 to take part in the two-week Conference of Parties (COP-17) meeting from November 28 – December 9. In a release December 5, TWA noted that NGOs, UN observers and the media at the meeting have shown “commendable interest” in the Tibet story and the Tibetan delegation has successfully kept the Tibetan agenda on “high stakes” at the conference despite China’s overwhelming influence. “It is significant to have the Tibet voice heard in this magnanimous gathering of leaders and activists with vested interest. This is especially so when China is painting a different picture of Tibet,” said Dolma. According to the release, the TWA delegation have proposed six key demands, which prominently include an immediate halt to all land uses that threaten the Tibetan Plateau's ecosystems, especially the plateau’s water resources; an immediate halt to the removal of Tibetan nomads from the grasslands; and a transparent, inclusive, and participatory trans-boundary resource management and decision-making mechanisms that includes all local and regional stakeholders whose lives depend on these ecosystem services, especially Tibet’s nomadic herders. “The environmental campaigns by Tibetan delegates include lobbying Government delegates and pressuring them to include Tibet in the negotiations, addressing press conferences and public talks, and making presentations on Tibet’s waters, dams, and the plight of Tibetan nomads,” TWA said. His Holiness the Dalai Lama has repeatedly urged world leaders to put global interest ahead of domestic interests when dealing with issues that affect the entire world. “The elected government, sometimes their number one priority is nation, national economy interest, and the global issues are sometimes secondary,” the Dalai Lama had said while addressing an environment conference in Sidney two years back. “That, I think, should change. The global issues should be number one. In some cases in order to protect global issues, some sacrifice of national interest is must”. TWA will also be launching a new publication ‘Purging the Treasure House: Displacement and the Status of the Tibetan Nomad’ on December7 at a public event. 11,810 delegates; 1409 NGOs, 86 Inter Governmental Organisations from 200 countries are attending the meeting, working for a breakthrough on the renewal of the global environmental treaty, the Kyoto Protocol, which expires next year. DHARAMSHALA December 4: Photos depicting China’s brutality in Tibet and the Chinese security official’s high-handed and vulgar display of power over Tibetan monks and commoners have been leaked out of Tibet. A Chinese website based in US - boxun.com, on Friday released eight photographs of Tibetans with their hands tied at their backs, being paraded publicly in military vehicles, escorted by security officials, and kneeling on the ground. Placards with their names and their “crimes” such as “separatist” are seen hung from their necks. Other photos also show large contingents of People's Armed Police and Special Branch of People's Armed Police carrying automatic rifles, manning the streets. While the website didn’t provide exact locations and date of the pictures, individuals and organisations in exile have identified few of the photographs. Speaking to Phayul, a monk at the exile base of the Kirti Monastery in Dharamshala, Kanyag Tsering identified that four of the photos were from Ngaba in eastern Tibet. “The ground where hundreds of Chinese armed security personnel are sitting is a public basketball ground in Ngaba Kriti town” Tsering told Phayul. “The photo taken from inside a car is also in Kriti as you can visibly see the Kriti monastery stupa at the back with Chinese security officials manning the intersection with automatic rifles right at the front,” added Tsering. Although Tsering wasn’t sure of the dates when the photographs were taken, the exiled monk recognised the houses and the streets in two other photos with armed Chinese security personnel marching in a show of power. “The photograph showing Chinese security forces in green and blue uniform is taken near the Ngaba town court,” said Tsering. The Kirti monastery in Ngaba and its surrounding regions have been facing growing restrictions since March this year after Phuntsog, a young Kirti monk self immolated protesting China’s occupation of Tibet and calling for the Dalai Lama’s return from exile. Since then, eleven more Tibetans, including monks, nuns, and lay people have set their bodies on fire, the latest being Tenzin Phuntsok who set himself ablaze in Chamdo on December 1. In the only on-ground report from Ngaba since March this year by foreign journalists, Robert Saiget, an AFP reporter in October said that “police, many carrying riot shields and armed with clubs and iron, lined the streets of the town”. “Large groups of soldiers in camouflage carried automatic rifles, metal rods with spiked tips and fire extinguishers, while police buses, trucks and armoured personnel carriers blocked the streets,” AFP had reported in accord with the recently leaked photographs. Writing on Facebook, the Beijing based award-winning Tibetan blogger and activist Woeser said that she was shocked to see the pictures. “These photos clearly show the suppression of the truth of the Tibetans,” Woeser said. That this House is greatly saddened by the disturbing news of 10 incidents of self-immolation in eastern Tibet by young Tibetan monks, former monks and a nun, five tragically losing their lives; condemns the Chinese government's ongoing repression in Tibet that serves to exacerbate the frustration and desperation felt by the Tibetan people; calls on the Prime Minister to make a public statement of concern about this grave situation; and further calls on the Government to make urgent representations to the Chinese government to urge that it takes measures to ease the situation by withdrawing its troops from Kirti monastery, to verify the condition and whereabouts of the monks who have disappeared since self-immolating, to allow international independent observers to visit the region and to respect the fundamental human rights of the Tibetan people including the right freely to practise their religion. Washington, DC: - The political leader (Kalon Tripa) of the Central Tibetan Administration, Dr. Lobsang Sangay's final two days of his first visit to US capital, Washington, DC since assuming office saw him keep up a hectic schedule of meetings with top congressional members and conducting various press interviews. Day four of the visit (November 3) started with a meeting with Senator Marco Rubio, the young and rising Republican Senator from the important U.S. electoral state of Florida. 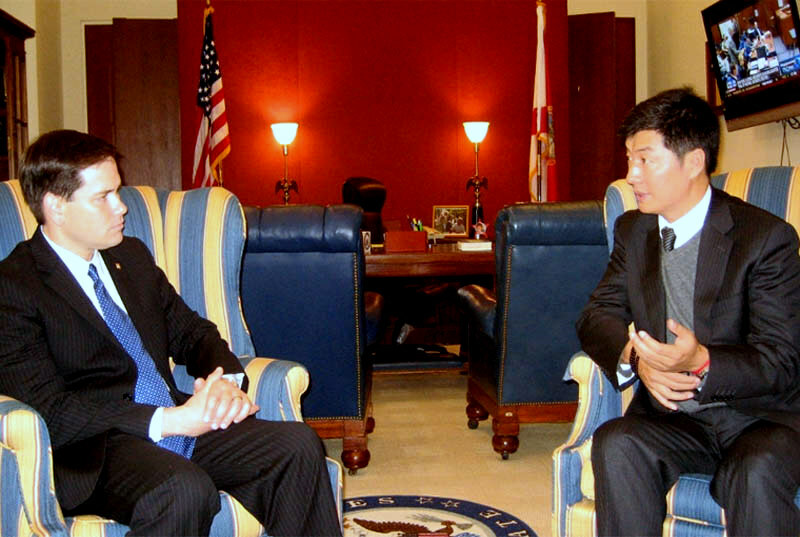 Senator Rubio was remarkably well informed on the current situation in Tibet and demonstrated real interest on Tibet. He lamented President Obama's less than enthusiastic support for the Tibetan issue. In a meeting of two young leaders (the Senator is 40 years old), the Senator told the Kalon Tripa that he was inspired by the Tibet cause, proud to be associated with the issue and wanted to lend his voice and support. He accepted the Kalon Tripa's invitation to visit Dharamshala. Kalon Tripa and his team came away from the meeting feeling that Tibet had made a new and important friend. The meeting with Representative Steve Chabot (R-OH) was focused on Nepal as the Congressman had recently come back from a trip to Nepal and Bhutan. Representative Chabot is the Chair of Middle East/South Asia Subcommittee. He expressed concern on the situation of Tibetans in Nepal. In his meeting with Representative Nita Lowey (D-NY), Ranking Member, Foreign Operations Subcommittee, the Kalon Tripa thanked the US Congress and government for supporting various Tibetan programs and also invited her to visit Dharamshala. A highlight of day four was the Kalon Tripa's testimony before the Tom Lantos Human Rights Commission. The hearing drew a full house of audience and three of the committee members attended. Dr. Sangay paid tribute to the late Congressman Lantos in his oral presentation and touched on the outbreak of self-immolation cases in Tibet, the transition in Tibetan political leadership, how the hardline policies of the PRC government was not working in Tibet, how the Tibet issue can be resolved, and His Holiness' recent statement on reincarnation and emanation. Dr. Sangay was warmly welcomed by both the Co-Chairs of the commission - Representative James McGovern (D-MA) and Representative Frank Wolf (R-VA). Rep. Wolf in particular spoke out strongly against the Chinese government and described it as a "fundamentally immoral and evil government." He stated that the Chinese government was bound to fall as they had taken a page out of the playbook of Nicolae Ceaușescu of Romania. The Congressman was particularly upset to learn that the Nepalese government had refused to issue exit passes that would allow 5000 Tibetans to immigrate to the US. 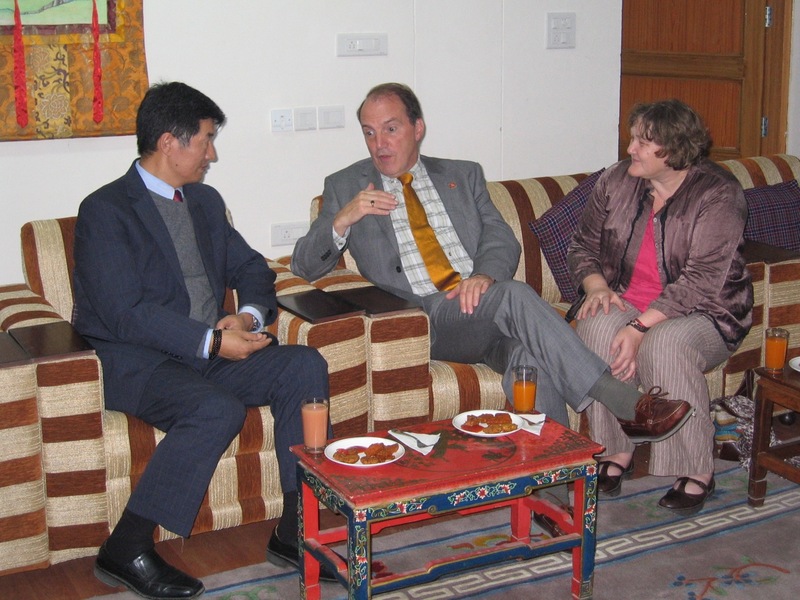 He, along with Rep. McGovern, stated that they would write and summon the Nepalese ambassador in Washington, DC and request the Nepalese government to allow the Tibetans to leave Nepal. The Congressman threatened to zero out all US foreign aid to Nepal if the latter did not issue the exit visas to the Tibetans. Another important witness testifying before the Commission was Kirti Rimpoche whose trip was organized by the Central Tibetan Administration (CTA). Since many of the Tibetans who had committed self-immolation in Tibet were related to Kirti Monastery, CTA felt it would be beneficial for the Committee members and staff to hear directly from Rimpoche. Immediately following the hearing, the Kalon Tripa had a meeting with Democrat Leader Pelosi, a long and steadfast friend of Tibetans, and her staff, Jonathan Stivers. Leader Pelosi expressed admiration for His Holiness in his move to transfer his political powers and welcomed the transition in Tibetan leadership to the next generation of Tibetans. The day ended with an interview with Al Jazeera for their The Stream program. Day five and the last day of the visit started off with interviews with VOA Mandarin service and with the VOA Tibetan television program. Kalon Tripa also met with Washington Post, which published his op-ed on the unfolding tragedy in Tibet centered around the growing cases of Tibetans committing self-immolations. The final event of the day was a reception organized by the Capital Area Tibetan Association (CATA) both for the Kalon Tripa and Kirti Rimpoche. DHARAMSHALA, November 9: China on Tuesday expressed its routine disappointment at Mongolia for allowing the Tibetan leader the Dalai Lama’s visit. reporters that Beijing has lodged its "stern representations" with Ulan Bator over the visit of the Tibetan leader reviled by Beijing as a “separatist” but admired world over as a champion of peace and a an eminent Buddhist leader. activities to split China in any form." devotee who attended the talk. The Mongolian Transportation Minister Battulga Khaltma told reporters following a cabinet meeting that the Dalai Lama's lectures for Wednesday and Thursday will be relocated to a less controversial location. However, Choijamtsa, the head of Gandhan Tegchiling monastery in Mongolia, who is one of the core organisers of the visit said that they are determined to go ahead with the planned lectures at the decided venues. to do it even if others oppose it," said Choijamtsa. DHARAMSHALA, November 8: The Tibetan spiritual leader His Holiness the Dalai Lama arrived in Mongolian capital Ulan Bator Monday on a three day visit, that has been kept confidential by the organisers until the last minute to avoid angering China. The Dalai Lama is expected to hold several public lectures and meet with Buddhist leaders of Mongolia. off all train links to the country for two days in an apparent retaliation for inviting the Dalai Lama, reviled by Beijing as “a splittist”. The Mongolian government has said that the visit is neither political nor official but a religious visit on the invitation of the Dalai Lama’s devotees in Mongolia. However, according to government sources, the president of Mongolia is likely to meet the Tibetan spiritual leader. Historically, Tibetans and Mongolians share a long history of priest – patron relationship. In 1578 the Mongol ruler Altan Khan bestowed the title Dalai Lama meaning ‘Ocean of Wisdom’ on Sonam Gyatso, the third in the lineage of the Dalai Lamas. China has to be called to account, not only to end the current crackdown in Kirti monastery, but also to respect the fundamental rights and freedoms of the Tibetan people. The British government must publicly state its concern over the current situation and, along with other international governments, persuade China to ease the increasingly tense situation by withdrawing its troops from Tibetan regions, especially from Kirti monastery, review its repressive policies in Tibet and grant universally recognised human rights to the Tibetan people. ► call on the British government and the Foreign Secretary to make a public statement of concern on China's repressive policies in Tibet which, since March this year, has led to nine monks and two nuns undertaking the desperate act of self-immolation. ► write to the Chinese Ambassador in the UK urging for China to ease the situation by withdrawing its troops from Kirti monastery and respecting the fundamental human rights of the Tibetan people including the right to freely practice their religion. ► to write to the Foreign Office to urge that pressure is put on China to allow international independent observers and journalists to visit Tibet and particularly Kirti monastery. To find your MP go to www.writetothem.com or findyourmp.parliament.uk. ► make a robust public statement of concern, in light of the recent immolations, which calls on the Chinese government to ease tensions by withdrawing its troops from Kirti monastery in Ngaba and to review its policies in Tibet to bring an end to the oppression of the Tibetan people. ► raise the self-immolations incidents with the Chinese Ministry of Religious Affairs, asking why, if there is religious freedom in Tibet as is purported, monks and nuns are undertaking such drastic forms of protest. Click here to go to the Human Rights report update on the FCO website. The comment section is at the bottom of the page. ► confirm the condition and location of Lobsang Kelsang, Lobsang Kunchok, Kelsang Wangchuk and Norbu Damdrul, all of whom self-immolated in Ngaba and were taken away by security forces. ► end the military lockdown at Kirti monastery and withdraw the security forces from Ngaba. ► release all the monks and lay-people who have been detained and imprisoned since March and provide independent legal counsel for all those facing charges. ► respect the fundamental right of the Tibetans to freely practice their religion. ► review its existing policies in Tibet in order to fulfill the aspirations of the Tibetan people for a truly harmonious society. Address: Ambassador Liu Xiaoming, Chinese Embassy, 49-51 Portland Place, London W1B 1JL. Note: The Embassy occassionally disables this email address (so your email is returned). If that is the case please try political@chinese-embassy.org.uk and/or press@chinese-embassy.org.uk. Gabriel Lafitte on Tibet's Nomads (Part 1) from sftuk on Vimeo. Gabriel Lafitte on Tibet's Nomads (Part 2) from sftuk on Vimeo. Gabriel Lafitte on Tibet's Nomads (Part 3) from sftuk on Vimeo. Days ago, Tenzin Wangmo walked out of her nunnery, covered herself in petrol and set herself on fire while pleading for a “free Tibet”. Minutes later she died -- she was just 20 years old. In the past month, seven other monks have self-immolated to protest a growing Chinese crackdown on the peaceful Tibetan people. These tragic acts are a desperate cry for help -- machine gun toting Chinese security forces are beating and disappearing monks, laying siege to monasteries, and even killing elderly people defending them -- all in an effort to suppress Tibetan rights. China severely restricts access to the region. But if we can get key governments to send diplomats in, break the blackout, and expose this growing brutality, we could save lives. Tibetans are suffocating under China’s stranglehold. They are unable to practice their religion freely -- just downloading a photograph of the Dalai Lama can land a Tibetan in prison. And it is getting worse: columns of Chinese troops have blockaded the largest monasteries and are abducting monks in "patriotic re-education" programmes. This horrific situation is spiraling out of control. Just yesterday another monk, Dawa Tsering, was rushed to hospital after setting himself ablaze, and with every protest China tightens it’s grip. For Tibetans, self immolations are a very severe sacrifice and reveal their level of despair. They are deeply religious and believe that if you commit suicide it has a devastating impact on the cycle of re-incarnations and may even put you back 500 lifetimes. But their situation is so horrific that they are forfeiting their position in the cycle in exchange for the hope of international attention and freedom for their brothers and sisters. The Chinese government won't allow journalists and human rights monitors into the region -- Sky news and AFP journalists were forced out last week. But diplomats can request access and get in and, as we have recently seen in Syria, they are the best way to get first hand reports, let China know that the world is watching and start high level political conversations on Tibetans’ human rights. Avaaz members have supported projects that are piercing the blackout and defending Tibetan culture and religious practice. But China’s ruthless crackdown is escalating. It’s time for our whole community to take a stand together with these peaceful people sacrificing their own lives for basic rights. Let’s show them that the world has not forgotten them. 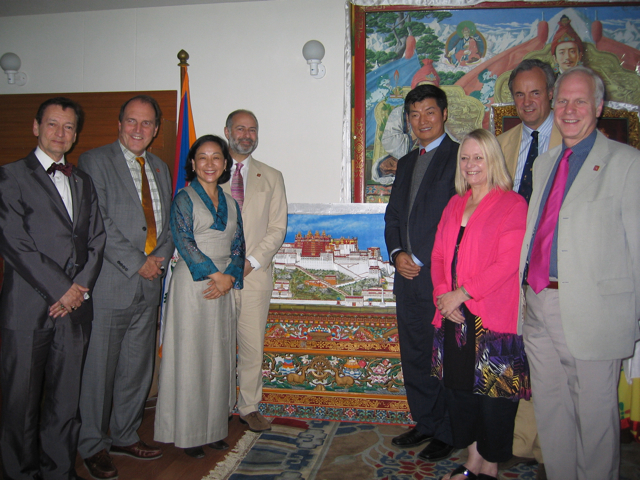 A discussion was held for an hour with Dr Sangay, which covered issues such as education (and the proposed scholarship scheme), long-term strategies to strengthen the exiled Tibetan community, negotiations with the Chinese government and the exiled government’s continued commitment to seeking genuine autonomy for Tibet. Members of the Kashag then joined us for dinner, which was hosted by Dr Sangay. MPs were able to have one-on-one discussions with Kalons (Ministers) Dicki Chhoyang, responsible for the Department of Information and International Relations (DIIR); Tsering Wangchuk, Department of Health; Dongchung Ngodup, Department of Security; plus Cabinet Secretary Migyur Dorjee (a former UK Representative of the Dalai Lama), DIIR Secretary Thubetn Samphel and Kalon Tripa Lobsang Sangay. The evening concluded with presentation of khatags and mementos. The Kalon Tripa presented each MP with a genuine sample of Tibetan currency, used prior to China’s invasion in 1950. Dr Sangay said this was a reminder that Tibet had been an independent country prior to the occupation. Fabian Hamilton, in return, presented Dr Sangay with a Portcullis clock (from the Houses of Parliament). 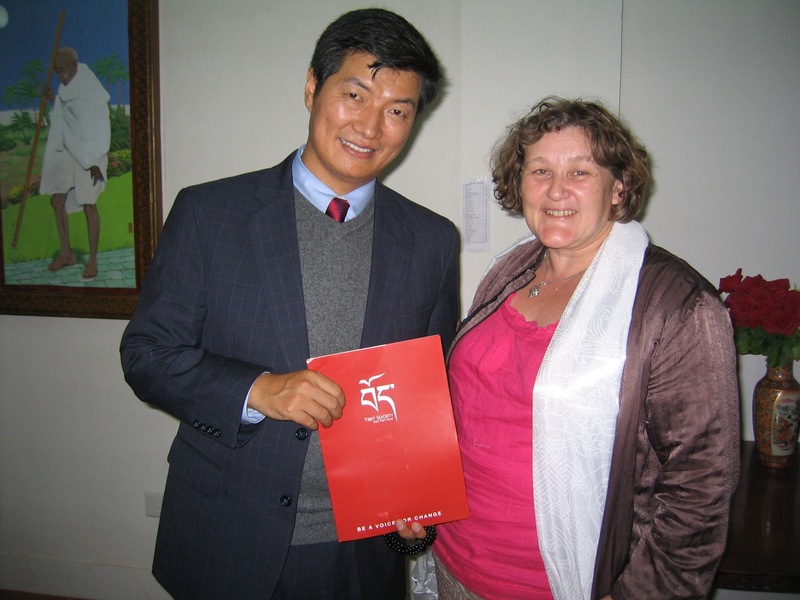 Philippa Carrick, CEO of Tibet Society, presented Lobsang Sangay with a small gift and an information pack about the work of Tibet Society and some small gifts to distribute amongst the Kalons. Fortunately, Dr Sangay’s chauffeur was present when we departed so James Gray was unable to take the Kalon Tripa’s car for a spin as he had hoped! DHARAMSHALA, October 18: Tibetan spiritual leader His Holiness the Dalai Lama will be joining a mass prayer gathering tomorrow at Tsug-la Khang in the exile seat of Dharamshala. The day-long prayer session and hunger fast is being organised by the Kashag (cabinet) to “express solidarity with all those who lost their lives and with all other Tibetans who are incarcerated for their courage to speak up for the rights of the Tibetan people”. Gyalwang Karmapa and Kirti Rinpoche, along with the entire staff of the Central Tibetan Administration (CTA) will be taking part in the prayer session. Since March this year, nine Tibetans have self-immolated in Tibet, protesting China’s continued occupation of Tibet and demanding the return of the Dalai Lama from exile. Lobsang Phuntsok (20), Tsewang Norbu (29), Khaying (18), Choephel (19), and Tenzin Wangmo (20) have all succumbed to their injuries, while there is no information on the well being and whereabouts of Lobsang Kelsang (18), Lobsang Kunchok (19), Kelsang Wangchuk (17), and Norbu Damdul (19). Announcing the jointly planned activities in India and the world-at-large with the Tibetan Parliament-in-Exile, Kalon Tripa Dr Lobsang Sangay last week called upon “all Tibetans and Tibet supporters in the free world to join efforts and organise activities in their respective regions”. 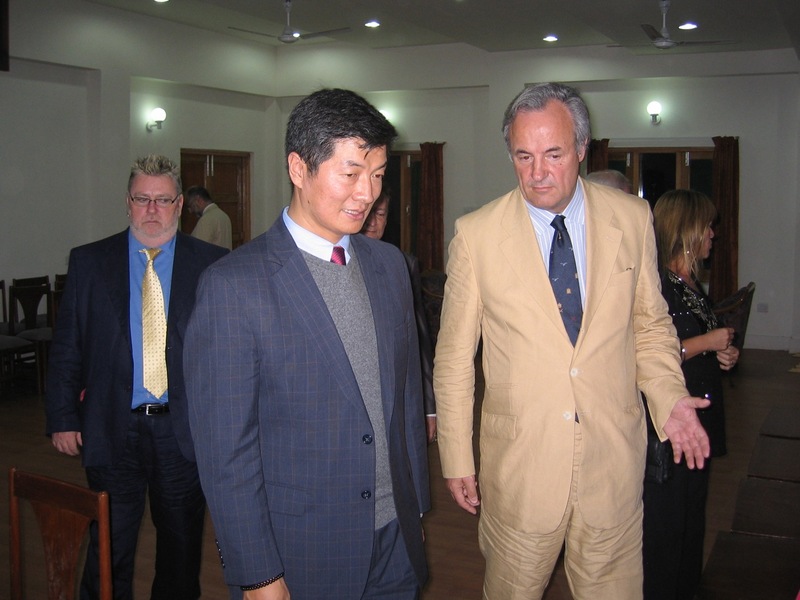 “We appeal to the United Nations, freedom-loving countries and people around the world to show their support and solidarity with the Tibetan people at this critical stage,” Dr Sangay said. DHARAMSHALA, October 18: In wake of the fiery episode of self-immolations in Tibet, China is reportedly planning to send 20,000 Chinese officials to Tibetan villages in the so called Tibet Autonomous Region (TAR) to “re-sculpture the minds of Tibetans”. "These Chinese officials will stay one year in the Tibetan villages to espouse patriotism and love for China," said Bawa Kalsang Gyaltsen, a member of Tibetan parliament and a China expert based in Dharamshala, the seat of Tibetan administration in exile. According to Gyaltsen, Chinese national flags and photos of Chinese leaders in large quantity will be distributed in all Tibetan villages. "Usually Tibetans in the villages put up photos of Chinese leaders on the altars and walls when Chinese officials visit the villages and pull them down once they leave," said Gyaltsen. This move of penetrating Tibetan villages is amongst the many policies being employed by the newly appointed Chinese party boss in Tibet, Chen Quanguo. Chinese government’s patriotic re-education campaigns in Tibetan monasteries and nunneries have been widely opposed by Tibetans and condemned by international observers. It is to be seen how Tibetan villages, which have an ethnic Tibetan majority unlike bigger towns and cities in TAR react to the new policy. Human Rights Watch in a press release last week had said that repressive policies and provocative policing techniques by the Chinese authorities were responsible for greater unrest and escalating tensions in the region. In this year alone, nine Tibetans, including a 20-year old nun, set themselves on fire protesting China’s continued occupation of Tibet. Tibet Burning: A campaign poster calling world's attention and support for the sacrifices being made by Tibetans inside Tibet. DHARAMSHALA, October 17: Reports coming out of Tibet confirm the demise of yet another Tibetan, this time a nun, after she torched her body in an apparent protest against China’s continued occupation of Tibet. Tenzin Wangmo, around 20 years of age, set herself on fire at around 1 pm local time in the Ngaba region of eastern Tibet today. The exile base of Kirti Monastery, citing eyewitnesses, in a release today said that Tenzin Wangmo self immolated on a crossroad near her monastery, the Mamae Dechen Choekhorling Nunnery, about 3 kms away from Ngaba County. “Tenzin Wangmo was engulfed in flames as she marched on the streets for nearly 7 to 8 minutes raising slogans calling for the return of His Holiness the Dalai Lama from exile and religious freedom in Tibet,” the release said. According to the release, nuns from the Mamae nunnery carried Tenzin Wangmo’s body to the nunnery and despite repeated warnings from Chinese security personnel, refuse to give possession of the deceased’s body. “The Chinese authorities have given the nuns an ultimatum to either hand over the deceased’s body or bury Tenzin Wangmo’s body by tonight,” the release said. The situation around Mamae nunnery, which is the largest nunnery in the Ngaba region with over 350 nuns, is being described as tense. This is the ninth incidence in this year alone when a Tibetan has been driven to the extreme sacrifice of burning one’s own body as a last resort of peaceful action against the Chinese government’s repressive policies in Tibet. The first 17 days of October has already witnessed five self-immolations in Ngaba region. Khaying, Choephel, and Tenzin Wangmo succumbed to their injuries while Kesang Wangchuk is being described in critical condition. There is no information as yet on the whereabouts of Norbu Damdul who was last seen being taken away by Chinese security personnel on October 15. The Central Tibetan Administration in a release earlier today said that His Holiness the Dalai Lama will be presiding over the “grand prayer service to mourn the tragic self-immolations in Tibet” scheduled for October 19 in Dharamshala, north India. DHARAMSHALA, October 17: Two Tibetans were shot for staging a peaceful demonstration demanding an end to China’s occupation of Tibet yesterday. Multiple sources with links inside Tibet are confirming the incidence that occurred outside a police station in Serthar County, Kardze, eastern Tibet. According to sources, a group of Tibetans gathered outside the police station and started raising slogans demanding freedom in Tibet and the return of His Holiness the Dalai Lama from exile. Reacting to the peaceful demonstration, Chinese security personnel started firing at the crowd, injuring two and arresting seven. The UK based group, Free Tibet in a report identified the two as Dawa and Druklo and said that “one was shot in the leg, the other in the torso”. “It is not known why security personnel opened fire, nor are there further details about the wellbeing and whereabouts of Dawa and Druklo, but it has been reported that they were taken from the scene by the local community,” the group said. Serthar County had recently witnessed repeated shows of discontent over Beijing’s heavy-handed rule. On October 1, a huge portrait of His Holiness the Dalai Lama and a Tibetan national flag were unfurled from the top of a building in the central town of Serthar. Chinese authorities’ removal of the portrait and flag entailed an impromptu demonstration by over 200 Tibetans. Later on October 13, a huge Tibetan national flag and flyers demanding the return of the Tibetan spiritual leader and freedom in Tibet were pasted outside Chinese security and administrative offices in the region. Following the announcement of campaigns by the exile administration to show solidarity with the sacrifices being made by Tibetans inside Tibet, beginning with the 24-hour hunger strike by Tibetan parliamentarians tomorrow in the Indian capital of New Delhi, calls for action have also been made from inside Tibet. Sources say that envelopes containing a “call for action” on October 19 are being distributed at restaurants and shops in the Serthar region. China has sentenced six monks, in connection with the death of Phuntsog, a monk from Kirti Monastery, Ngaba County who died on 17 March after setting himself on fire. All six monks were very closely related to Phuntsog. UPDATE Three monks were sentenced in September. Two of them Dorjee, only 16 and Tseko, 22 are said to be Phuntsog's best friends. Lobsang Darjee is one of Phuntsog's brothers. The charges against are not known. All three were sentenced to re-eduation through labour. Re-education through labour is a system of administrative detention in China, issued by the police not a judicial court. In 2008 the UN Special Rapporteur on Torture concluded that re-education through labour is " systematic form of inhuman and degrading treatment or punishment, if not torture". Three monks were sentenced in August to lengthy prison sentences. Phuntsog’s uncle, Tsundue was sentenced to 11 years imprisonment for “intentional homicide” which included delaying treatment. Tsering Tamding, 22 and Lobsang Tenzin, 21 were sentenced to 13 and 10 years respectively for “plotting and assisting” in the self-immolation. Chinese state media reports that the three monks ‘confessed to their crimes’ raises the risk they were ill-treated while in custody and may have been subject to degrading treatment or even torture. The charge that other monks instigated and assisted Phuntsog have been rigorously denied by a spokesperson at Kirti Monastery in Dharamsala, India and do not reflect the non-violent nature of Tibetan opposition to China’s occupation. Although it has been impossible to confirm exactly what led to the delays in Phuntsog being taken to hospital, we can only speculate that this was informed by concerns that Phuntsog might be taken into detention. Tabe, another monk from Kirti monastery who set himself on fire in 2009 was detained at the scene and his whereabouts remain unknown. Tabe’s parents are able to visit him at the invitation of authorities but for very limited periods. Tabe has also been used for propaganda purposes. In July this year he was interviewed on a local TV channel where he said he regretted what he did. It is not possible to confirm if Tabe gave the interview under duress. Free Tibet believes that these prosecutions are part of a wider pattern of abuses in response to the acts of self-immolation, which are aimed at preventing further acts of protest as well as deterring people from disseminating information within Tibet and externally, including to the international media who are unable to report freely from Tibet. The acts of self immolation secured global media coverage exposing how desperate some Tibetans have become, in direct conflict with the images and rhetoric the Chinese state promotes. 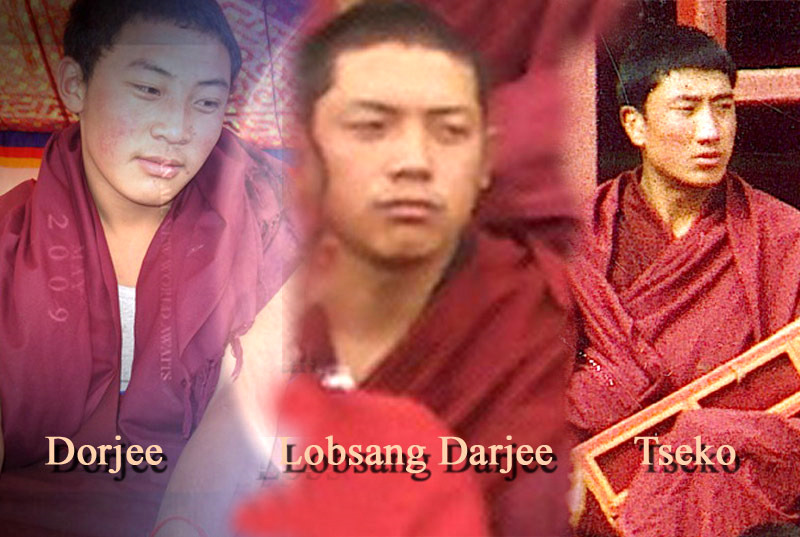 20-year-old Lobsang Tenzin alias Tenjam was sentenced to 10 years in prison on 30 August 2011. It is understood that anyone closely associated with any of the three monks who self-immolated are “under intense pressure”. According to Chinese state media, a monk accused of emailing a photograph of Phuntsog to ‘a monk living abroad’ will be sentenced shortly. Another monk from Kirti monastery, Gotsang Jamyang, is already serving a 6-year sentence for sending information about Tabe’s self –immolation in 2009. Two monks from Nyitso monastery, where Tsewang Norbu resided before he self-immolated in August, have also been detained on unknown charges. Following the 2008 protests, there was a similar spate of sentences for those accused of sharing information, including a life sentence for a young Tibetan NGO worker in Lhasa, accused of emailing information about the protests overseas. DHARAMSHALA, October 8: Following the tragic incidents of self immolations in Tibet and a benumbed unresponsiveness from the exile Tibetan administration, a global coalition of Tibetans and supporters are planning a mass mobilisation at Chinese embassies across the world on Wednesday November 2. In an urgent appeal letter, ITN is urging Tibet Support Groups to take part in a step by step process to build political pressure on China, through lobbying respective governments and increasing grassroots support as a build up to the G20 summit in France from November 3 – 4. President Hu Jintao will be representing China at the G20 summit. Reminding its member organisations that “Tibet and Tibetans need a roar of support from the international community,” ITN warned that unless the international community intervenes, these “desperate acts may continue”. “We believe that the desperation behind these immolations warrants a large scale international response, both to put pressure on China to address Tibetans' legitimate grievances, and to show Tibetans in Tibet that we have heard them and are responding to their anguish,” ITN said. In a call for campaign, Tenzin Dorjee, executive director of Students for a Free Tibet (SFT) and one of the main organisers of the campaign said that China's “systematic repression and tyrannical rule” in Tibet was driving Tibetans to take extreme actions. “While these young men have decided to sacrifice their lives, it's not an escape from life's suffering they are seeking. It's freedom. Not only for themselves, but for their nation”, Dorjee said. Pushing for a coordinated international response to condemn China’s repressive measures in Tibet, Dorjee encouraged Tibetans and Tibet supporters to take part in the global campaign. Yesterday, two Tibetans, Choephel and Khayang, both in their late teens had torched their bodies, continuing the fiery episode of anti-China protests. While Choephel is feared dead, Khayang is reportedly in serioius condition.